February 1 was one of my best memories of 2009. It was Super Sunday, when the Steelers defeated the Arizona Cardinals 27 to 23. Thing is, I’m not from Pittsburgh, not a Steelers fan and not a big football watcher. I did witness parts of the big game and confess to watching that goofy halftime show with Bruce Springsteen. But by then my day was already made: I’d seen something way more exciting. I first noticed the birds from an upstairs window. By their size and shape I assumed they were pine siskins—not an everyday species in my backyard. So I hustled downstairs to get a better look. That’s when my eyes nearly bugged out. Right there, enjoying a mid-winter snack on my thistle feeder, were three finches wearing little crimson caps. Common redpolls! Having lived here for 12 years, avian surprises of this magnitude are few. This was a backyard first, and only the third time I’d ever seen redpolls anywhere. Redpolls and siskins are members of a group we call the winter finches. They are “irruptive species,” meaning they sometimes appear here in great numbers. The key word is sometimes. It all depends on the winter food supply on their northern breeding grounds. If the cone and seed crop is good, they may never leave Canada. But when food is scarce, the birds wander south in nomadic flocks. It’s during those winters that our thistle (or niger) feeders become finch magnets. So be ready, and keep your feeders full. The goldfinches will love you for it, of course, and with luck so might a common redpoll, pine siskin or purple finch. These species were widely reported in our region last winter. Another coveted winter finch, the white-winged crossbill, also “irrupted” here in 2009. This species was fairly easy to find if you went looking for it—but not at feeders. White-wings prefer conifers. They dine in trees or on the ground, picking at cones. Morton Arboretum is one of the best local spots to observe them, in the hemlocks and spruces. Siskins, on the other hand, could become daily customers if you keep a thistle feeder. This winter, look closely for siskins, purple finches and redpolls. If you don’t already know these species, look them up in a field guide so you are well prepared. They are not difficult to identify, but they are not flashy either, so you need to be alert. The first siskin I ever saw was on my thistle feeder—still my only “backyard lifer.” But the “Super redpolls” last winter thrilled me even more. I’d waited so darn long for those guys. The redpolls, unfortunately, disappeared after 20 minutes and never returned—at least not when I was watching. Thistle feeders all over the region, however, continued to pull them in throughout February, delighting birders and surely adding to many a life list. The feeder at Cantigny Park in Wheaton hosted redpolls right into early March. If you have birch or alder trees in your yard, watch those too. Redpolls love the seed catkins. Will this winter provide similar viewing opportunities? Well, a widely watched winter finch forecast says probably not. The report, published annually by Canadian ornithologist Ron Pittaway, indicates that natural food sources will be plentiful in the far north. So the winter finches may not need our handouts. Yet birding, thankfully, isn’t always so predictable. Even in “non-irruptive” years there are certainly redpolls, purple finches, siskins and crossbills in the area. Not as many, but some. It’s our duty as birders to keep an eye out for them. Copyright 2009 Jeff Reiter. All rights reserved. Have you seen and heard the kinglet? If not, the finer inner world of nature is a sealed book to you. When your senses take in the kinglet they will take in a thousand other objects that now escape you. These words are from an essay by the naturalist John Burroughs, written in 1899. His point is just as valid today. That is, there’s much more to learn and discover if we tune in a little more closely. Birding is about hearing, not just seeing. For many, including me, learning bird calls and songs is the next frontier, the essential next step in skill development and a path to enjoying the hobby even more. I’m often reminded of my own shortcomings in this area. Last month, while leading a bird walk at Cantigny Park in Wheaton, I was upstaged by an 11-year-old boy. As we walked he picked out the song of a yellow-throated vireo. Sure enough, a few moments later we were watching the bird. I never mind being upstaged—bird walks are cooperative efforts. And I’m always happy to see young birders. Sadly, they are as scarce as cerulean warblers in these parts. So it was both pleasing and impressive when the boy at Cantigny found that vireo for the group. He had “a good ear,” as birders say, and we all benefited. We know that young people generally have better hearing than older people, and their memories are better, too. The Cantigny Kid heard that vireo song before and remembered it. The rest of us might need to work harder at this. Making a correct ID often depends entirely on knowing a bird’s call or song. Sometimes we never see the bird. On that same Cantigny walk, somebody asked if birds that we hear but do not see are “countable.” Good question, and my answer to it is always yes. If you hear a bird, and you’re 100% sure about what it is, why would you not count it? There’s one species on my yard list that I’ve still never seen—Eastern screech owl. When it calls there is no mistaking this nocturnal sprite, and it’s always a thrill when one visits the neighborhood. Counting “heard birds” is also the right thing to do. Kenn Kaufman wrote a thoughtful column about this in Bird Watcher’s Digest. Too often, he said, overly enthusiastic birders create stress for birds when they attempt to further validate an ID by getting a visual. They might march through a swamp to flush a secretive rail, or play a recording over and over to lure an elusive warbler into view. Not good! Fortunately, most birders feel that when out watching birds, we are the guests. We behave responsibly and show respect for the birds. We stay on the trail and minimize our impact on their space. This approach places a premium on good listening skills, and there are many resources to help you improve. I’ve mentioned one before: the “Birding by Ear” CDs from Peterson Field Guides. The CDs are low tech compared with other options but they are far from obsolete. I’m also a fan of the Cornell Lab of Ornithology website—the All About Birds section in particular. With a few clicks you can hear any bird in North America. Go to www.birds.cornell.edu. If you own an iPod, iPod Touch or iPhone, some powerful apps are waiting. Software like birdJam and iBird Explorer can turn your device into an electronic field guide, complete with pictures, text, range maps and songs. Within seconds, you can check a bird’s ID based on sound or sight. Some of my friends are devoted birdJam or iBird users. They love the convenience, portability and speed of their gadgets. Most of all, they love playing those bird songs. The technology is very slick. Me, I’m still birding the old-fashioned way. In the field, all I really want is a good pair of binoculars and some interesting birds. If those birds are making noise, even better. I’ll be listening, enjoying and always learning. The Apple Store can wait. Last month’s Midwest Birding Symposium in Ohio attracted just over 800 bird nerds like me and many of the biggest names in the hobby—Kenn Kaufman, David Sibley, Scott Weidensaul, Bill Thompson and Julie Zickefoose among them. Even Jane Alexander, the actress, gave a talk, proving that people in the public eye occasionally do come forward and confess their passion for watching birds. The Symposium’s most notable guest, however, was a big surprise. He kept a low profile and didn’t attend the scheduled events but still created quite a stir. A Kirtland’s warbler will tend to do that. The male bird was discovered in a park about five miles away from the convention, which took place in Lakeside, just east of Toledo. Word of the sighting spread quickly, causing many Symposium participants to “blow off classes” and chase the bird instead. Kirtland’s warbler is our nation’s rarest songbird, an endangered species that all birders long to see. It’s actually not a difficult bird to observe, but only if you visit the bird’s primary breeding grounds in north central Michigan. Seeing a Kirtland’s during migration, however, is a long shot. The species is virtually invisible as it travels to its winter home in the Bahamas. It’s slightly ironic, therefore, that the species was actually discovered in Ohio—in 1851, by a man named Kirtland. It took another 52 years before anyone found the warbler’s nesting territory in Michigan. Over the years there have been occasional Kirtland’s sightings along the Chicago lakeshore, causing the local birding community to go bonkers. So you can imagine the excitement we felt at Lakeside—a rare opportunity to see a very rare bird! I’d seen the Kirtland’s before, near Mio, Michigan, in 1999. But of course I was craving another look. And to see the species in Ohio, my home state, would be a nice bonus. I arrived at the Symposium on Friday around noon. By then, Kirtland’s fever was in full bloom. A decision had to be made—go for the bird or go to the afternoon seminars? Having birded all morning at Ottawa National Wildlife Refuge, I elected to stay in Lakeside and enjoy the event I’d driven 300 miles to attend. Maybe this was a mistake. Plenty of birders saw the Kirtland’s that afternoon. At dinner, the most common question was “Did you see it?” And if you hadn’t, would you be trying for it in the morning? For me the answer was easy. So there I was the next day at 7 a.m., participating in a classic stake-out. Seriously, that’s what it’s called when birders gather to find a previously spotted rarity. Scraps of paper with handwritten notes littered the trail, each indicating the time and place where the Kirtland’s was sighted the day before. Some people who’d already seen the bird were back again, pointing to trees and shrubs where the Symposium’s guest of honor had perched just 12 hours earlier. After an hour of waiting and searching and no bird, the stake-out began to break down. Patience was running thin, and some good breakfast spots were just down the road. The warbler, most of us conceded, was likely a one-day wonder. Unlucky for us, that day was yesterday. Oh well, now I have a good excuse to make a return visit to “Kirtland’s territory” in Michigan. And—great news—the bird is getting easier to see! Intense and ongoing habitat management efforts are paying off big. 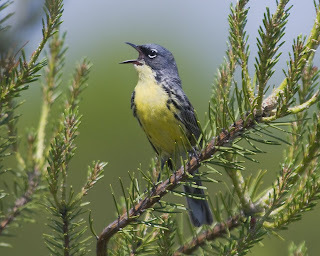 In 2008, the Kirtland’s warbler breeding population in Michigan was estimated to be 3,600—up tenfold from 20 years ago. Once on the brink of extinction, the lemon-breasted warbler has staged an amazing recovery. If birders and conservationists had their way, Michigan’s official state bird would not be the American robin. Maybe Jane Alexander can have a chat with the governor. In the meantime, make plans to go witness a Kirtland’s warbler next spring. An excellent opportunity will be the Kirtland’s Warbler Wildlife Festival on May 15 in Roscommon, Mich. You’ll see the bird and learn its fascinating story. Full details and some great photos are online at http://warbler.kirtland.edu. 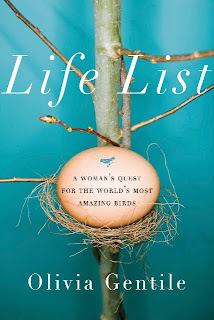 My mother, naturally a loyal follower of Words on Birds, recently chided me about the term “life list.” She said it seems to appear in all of my columns. I then reminded her that I’m a birder. “Life List,” as you can imagine, is largely about obsession. The book’s subhead reads “A Woman’s Quest for the World’s Most Amazing Birds.” Birders eat these books up, and so do a few non-birders. There’s something compelling about stories of people who go over the edge in all-out pursuit of a passion, in this case birding. We want to know where they went and what they saw. Some, like me, want to know how they got away with it. No birder I know can resist Kenn Kaufman’s “Kingbird Highway,” published in 1997. Subhead: The Story of a Natural Obsession That Got a Little Out of Hand. Then came “The Big Year,” by Mark Obmascik. Subhead: A Tale of Man, Nature, and Fowl Obsession. These books were about one-year bird chases around the U.S. Most recently, we gobbled up “To See Every Bird On Earth,” by Dan Koeppel. Subhead: A Father, a Son, and a Lifelong Obsession. There’s that o-word again—do I detect a pattern? I strongly recommend the three books just mentioned. They entertain and inform, and each is well written. But “Life List” is something else—an exceptional biography in every way. I can see it appealing to people who don’t give a hoot about birding. In fact, it has all the elements to make a really good movie—perhaps the first major motion picture with a bird-theme since March of the Penguins in 2005. But that film was about birds. This one would be about birding, and a woman who took “competitive listing” to a new level. Phoebe Snetsinger’s autobiography was published posthumously in 2003 by the American Birding Association. It was called “Birding on Borrowed Time,” a reference to the cancer diagnosis Snetsinger received at age 49. Doctors gave her one year to live. The autobiography was essentially a travelogue—interesting in parts, a little dull in others. At least the cover was nice. It shows a male Blackburnian warbler, the “spark bird” that hooked Snetsinger on birding. “Life List” goes a lot deeper and gets personal. Gentile contacted dozens of people who knew Phoebe well, including family members. Turns out she wasn’t as one-dimensional as some might think. She was obsessed with bird listing, certainly, and that poisoned her marriage and alienated her children. Snetsigner even skipped her mother’s funeral and a daughter’s wedding due to previously scheduled international birding trips. Ouch. But “Life List” also reveals a warm side. She was a willing teacher with a kind heart. She had many friends. Phoebe spent her childhood in the Chicago area. She was the daughter of Leo Burnett, a giant in the advertising world. This adds yet another interesting layer to Gentile’s book. And there are so many layers. The cancer “death sentence,” of course, and also the sexual assault that Snetsinger suffered on a birding trip to New Guinea. Even that didn’t slow her down. She continued putting her safety and health at risk while traveling the globe in search of new birds. Melanoma never did claim Snetsinger’s life. Fittingly, she died with her binoculars on, the victim of a rollover van crash in Madagascar. She was 68. I can’t say enough about “Life List.” It is simply a fascinating book, superbly written and researched. Every birder should read it. Olivia Gentile will speak about her book and sign copies on Tuesday, Oct. 27, at the Evanston Ecology Center. The evening talk is sponsored by the Evanston North Shore Bird Club and open to the public. For details, visit ensbc.org. Learning more about Eastern bluebirds has been on my to-do list for years. I’ve been keeping a file on the species, reading bits and pieces, but that’s not the same as getting out there on the trail. So I finally popped the question: Will you take me with you? Jody and Jerry Zamirowski were happy to grant my wish. 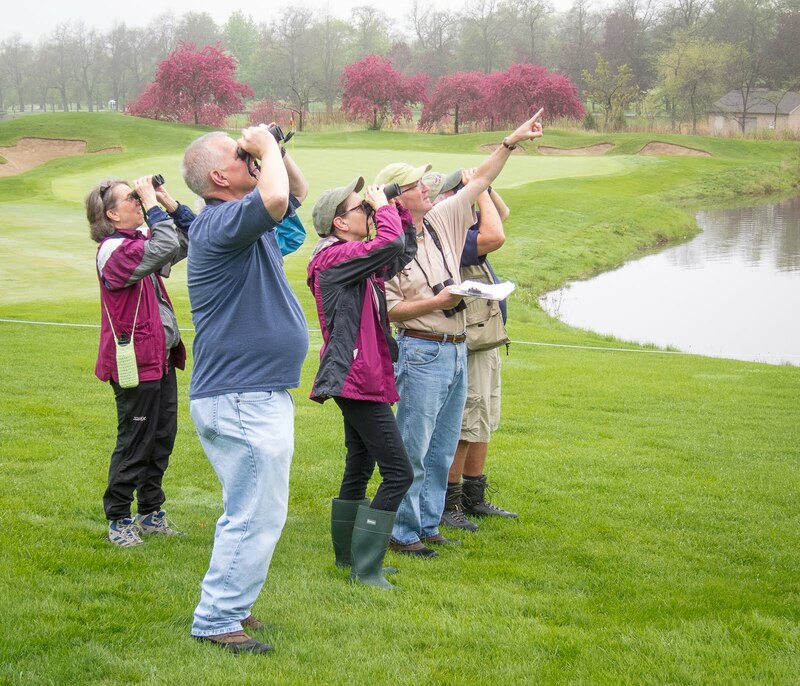 The Glen Ellyn couple is among the 24 volunteers who monitor the bluebird nesting boxes at the Morton Arboretum in Lisle. They’ve been doing it since 1996—because they enjoy it, and because the birds really need them. As recently as the early 1980s there were no bluebirds nesting in this area. They’d been squeezed out by abundant non-native bird species like house sparrows and starlings, which compete with bluebirds for nesting cavities such as abandoned woodpecker holes. With less open space and fewer dead trees due to urban development, bluebirds faced a serious habitat shortage. That’s when bird clubs, local Audubon chapters and other concerned groups stepped in to help. Their grassroots efforts have made a huge difference all across the nation—bluebird numbers have been rising steadily for two decades. This remarkable success story is reflected at the Arboretum. Ginny Stohr, manager of the project since 2002, says bluebird boxes first appeared at the Arb in the mid-1980s, when a Boy Scout troop donated about 15 houses. Bluebirds didn’t find them immediately, but they didn’t stay vacant for long. More boxes were added for a total of 34 by 1988. Today there are 102. It takes a lot of boxes to move the needle because bluebirds are not the only species that uses them. The entry holes are sized to keep out starlings, yet tree swallows, house wrens and house sparrows are common invaders. In fact, only three of the 10 houses on Jody and Jerry's section of the “bluebird trail” were hosting the species they were intended for. You can tell instantly what species is using a particular box. The tree swallow nests featured gobs of feathers from other birds. The house wren nest we encountered was just a mass of little sticks, from floor to ceiling. We didn’t find any house sparrow tenants, but if we had they would have been evicted. Other species, primarily tree swallows, are welcome to stay. Jerry and Jody informed me that bluebirds raise two and sometimes three broods in a single season. Tree swallows only raise one. So when baby swallows fledge, their nests can be cleared out, creating new space for bluebirds. The first box we opened—by Jerry, with his trusty Phillips-head screwdriver—contained five baby bluebirds, huddled together in a tidy nest of brown grasses. It was a perfect scene, exactly what a monitor hopes to find. Seventy-nine bluebird nests were recorded at the Arb in 2008, the most since 84 nests in 2001. The average nest count in the 1990s was just 45. The key stat, though, is fledged birds—bluebirds that hatch and survive. There were 216 fledglings in 2008, and 268 in 2007, the best year ever. In the 1990s, the average was 118. More nesting boxes contributed to the growth, along with an intensified volunteer effort. Collecting all the data is hard work. Monitors like Jody and Jerry must check their assigned boxes at least once a week. They record the number of nests, eggs, hatched eggs and fledged birds. There's a lot of walking through high, wet grass—often to areas of the Arb that most visitors never see. The fruit of this labor is that bluebirds—a species so beloved that there’s even a North American Bluebird Society—are now thriving in parts of DuPage County. This was unthinkable 25 years ago. And she and Jerry are not just assisting Eastern bluebirds. They keep track of all the birds they see as part of a collaboration between the Bird Conservation Network and Morton Arboretum. Their observations, and those of the other monitors, have a direct influence on habitat management. For example, various open areas at the Arb are no longer mowed during nesting season for the benefit of grassland birds like bobolinks, dickcissels, meadowlarks, savannah sparrows and sedge wrens. We saw each of these species on the morning of my visit, with the exception of sedge wren, which Jerry had seen the week before. “Just a slight modification in mowing practices can be good,” Jerry said, and he credits the Arb for being willing to manage the habitat based on real-time information provided by the bird monitors. Not just willing, eager. Kurt Dreisilker, the Arb’s manager of natural resources, is a big fan of the bird monitoring program. The volunteers, he says, keep him well informed about birds inhabiting the grounds, supplementing his own data collection. “They are incredibly devoted and motivated people,” Dreisilker said, speaking of the Zamirowskis. But he could have been describing any of the two dozen advocates who care so deeply about the Arboretum’s birdlife. It’s nice to see their collective efforts making such a positive difference. “Citizen science” is alive and well, just like the bluebirds. One of the things I like most about birding is the surprises. 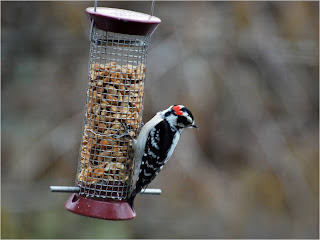 Like the hairy woodpecker that's been visiting my peanut feeder. It has two red spots on its head instead of one. I swear. Also strange was seeing a pine siskin in my backyard on May 20. I'd never seen one of these “winter finches” so late before—well after the last juncos had headed north. Siskins as well as white-winged crossbills were all over the region this spring, mingling with the warblers. Weird. Cattle egrets—another big surprise. This spring they were seen grazing in Chicago's Lincoln Park and also at the Morton Arboretum in Lisle. Not many birders, myself included, had ever observed this species in Illinois before. The cattle egrets, plus my recent acquisition a 45-year-old booklet called Birds of The Morton Arboretum, started me thinking about changes in the local birdlife. What birds are showing up here now that never did before? And which ones were once common but now are rare or completely gone? I found the booklet at a used book sale and what a treasure! It's even signed by the author. That would be the late Floyd Swink, the Arb's resident bird expert for many years who knew the place like his own backyard. From Swink's species descriptions it's apparent that our avian landscape has changed a lot since the 1960s. Consider his write-up on the tufted titmouse: “Frequent in the woods; can be seen any time of year; it's cheery whistle is a commonly heard song.” Titmice were a nesting species at the Arb. Today, finding a titmouse around here takes a lot of luck. The same goes for black terns, which Swink said were “flying over ponds and marshes May through September.” Not any more. The text indicates that warblers such as cerulean, blue-winged and golden-winged were common, as were bobwhite quail and whip-poor-wills. As birders, we long for those days. The booklet is also fascinating for the historic sightings it reveals. Like the golden eagle observed at the Arboretum on Nov. 10, 1946, or the burrowing owl seen on April 21, 1953. One species not listed in the booklet that's been seen annually at the Arb in recent years is the yellow-throated warbler. Cattle egret is absent, too. Indeed, there are a few other birds that are actually more common here today than 40 years ago. Examples are blue-gray gnatcatcher, red-bellied woodpecker and Carolina wren. The ranges for these species, as with yellow-throated warbler, have expanded northward. But the hard reality is that a lot of birds are suffering alarming population declines due to habitat loss and other factors. Swink saw it happening 40 years ago, I'm sure, and now the trend is accelerating. In March, several major conservation groups and government wildlife agencies teamed up to release The State of the Birds. It's an enlightening but sobering report that explains what bird species are in trouble and why. Out of the 800 species you could hope to see in the United States, 67 are listed as federally endangered or threatened. An additional 184 are on a watch list due to their small distribution, high threats or declining populations. But it's not all doom and gloom. Sidebars in the report tell how some endangered or threatened species have bounced back. Among them: bald eagle, peregrine falcon and American white pelican. Even the rarest of all warblers, Kirtland's, is showing improvement. Want more good news? In March, the Illinois Endangered Species Protection Board removed Henslow's sparrow, bald eagle and sandhill crane from its priority list. The connection between birding and conservation has always existed but now it seems to be tightening. This is good, and some would say it's about time. Birding is fun. That's why we do it. But we need to remember the big picture and give back. For some excellent ideas, check out 101 Ways to Help Birds by Laura Erickson. The State of the Birds report is well worth a look too, including the 7-minute summary video. You can see both at stateofthebirds.org. According to some financial advisers, the stock market crash and lingering recession means that those of us who had hoped to retire at 60 or soon after must now work until we are 80. Ouch. By then my eyes and ears might not be so good, and I need them for birding. I'm exaggerating, of course. No way am I reporting to an office at 80, or even 70. My golden years, hopefully, will be filled with birding. In my yard, in DuPage County and all over the country. If there's any money left, maybe a few international trips, too. I do envy those who are already retired and those with flexible work schedules. You have the freedom to go birding a lot more often. I had a taste of that a year ago at this time when I was job searching. Naturally I devoted some of my down time to watching birds. On weekdays! What a strange but delicious experience that was after 11 straight years of going to work Monday through Friday. One morning I went to Elsen's Hill (at West DuPage Woods Forest Preserve in Winfield) and had the place to myself. By noon I'd enjoyed outstanding views of a singing wood thrush; watched an olive-sided flycatcher catch and eat a bumblebee; and heard an odd-sounding common yellowthroat that popped into view and then morphed into my second-ever Connecticut warbler. Wow! If this is “retirement living” then count me in! Thankfully, my job hunt ended successfully after a few months. So this migration season my time for birding during the week is limited, just like the old days. And once again, I'm looking for ways to add a little more birding time to my daily routine. One of the great things about birding is that you can do it anywhere. Another is that it doesn't have to be time consuming. Birds are all around, especially now. It's just a matter of noticing them. Take your lunch outside a few times this month. Sit in that green space outside your office building. Walk, if you can, to the nearest park. Drive to the closest forest preserve. Then fill your binoculars with a scarlet tanager, a Baltimore oriole or indigo bunting. If you're really fortunate, a Blackburnian warbler. But even a less dazzling migrant, like a catbird or flycatcher, can make your day. Just the sound of a catbird is enough for me. Try to maximize your backyard birding, too. Take your morning coffee or tea outside—a few minutes on the patio can yield surprising rewards. On Easter I watched a migrating American bittern fly over my home, heading north. As “yard birds” go, this one was a complete bonus—a species I never expected to see. Timing is everything! But it's also the magic of spring, when the treasure hunt we call birding is at its best. What will we see today? In May, the possibilities are always exciting. Keep a pair of binoculars close. Whatever you do, get out this month and enjoy the birds. Watch them as much as you can—for a few minutes, a lunch hour or all morning long. If you're retired and have lots of time, lucky you! For the rest of us, it helps to remember that “spring migration fever” is a legitimate illness. The best remedy is a day off, weather permitting. It was an interesting winter in my backyard, highlighted by three common redpolls at the thistle feeder on Super Sunday. It was the first time we'd hosted this species since moving to Glen Ellyn in 1997! Another satisfying feeder sighting—on the peanuts, not the thistle—was a pair of hairy woodpeckers. 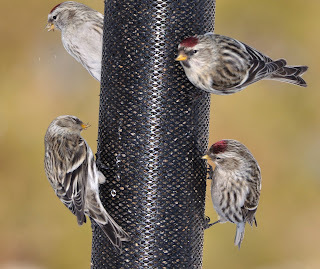 These are not “locally rare” like redpolls but they're far from common in the neighborhood. Until February, in fact, I'd never once seen a hairy use my feeders. It was the kind of small victory that we birders tend to cherish. This is a good time to discuss woodpeckers because April is when one of our best-named birds passes through our region, on its way north. Yes, there really is a yellow-bellied sapsucker, and now is time to watch for it. You might see evidence of sapsuckers before you see the bird itself. The telltale sign: a grid pattern of little holes or “sap wells” etched in tree trunk or branch. Their precision woodworking doesn't usually harm the tree, but the holes may be visible for years. The fruit of their labor, naturally, is sap, which sapsuckers consume with special tongues that have a brush-like tip. The sap attracts insects too, which are a key part of the bird’s diet. Another cool fact: the sap wells can be a food source for hummingbirds in early spring, before nectar is available. The yellow-bellied sapsucker is one of 22 woodpecker species in North America, and among the seven you can see in DuPage County. The most common by far is the downy. Like the hairy, his larger, look-alike cousin, downy woodpeckers are non-migratory. Downy vs. hairy is really the only significant identification challenge with the local woodpeckers. The key differentiation is bill size—tiny on the downy, prominent on the hairy. Body size is a good clue as well. If you are used to seeing downies at your feeder and suddenly a hairy flies in, you'll notice the difference. The males of both species have a red spot on their heads. The four other woodpeckers to look for are red-bellied, Northern flicker, red-headed and pileated. I don’t see red-bellieds in my yard nearly enough, but they are increasingly common in our local woodlands. That wasn’t always the case. Traditionally a “southern woodpecker,” the range for this species has expanded northward in recent decades. The red-bellied woodpecker, by the way, needs a better name. Its red belly is just a small pinkish area that’s not usually obvious. “Zebra-backed woodpecker” would be a lot more descriptive. The red-headed woodpecker, which is perfectly named, is hard to find around here. While I dream that one of these striking birds will some day visit my yard, that's not very likely. Their population is sharply declining because of habitat loss; they prefer long-dead, barkless trees in open areas. Churchill Woods Forest Preserve in Glen Ellyn is worth a try if you are searching for a red-headed. When visiting Cantigny Park in Wheaton, check the trees around the First Division Museum. Northern flickers, unlike other woodpeckers, are often seen on the ground. That's because ants are one of their favorite foods. Flickers are easy to ID in flight—look for a large patch of white on the rump. If you get a good look, the bird's yellow wing and tail linings will be evident, too. One other woodpecker, the pileated, is considered a prize sighting in DuPage. Field guides indicate the species is possible here year-round. That's true, but actually seeing one is another story. The Chicago region just doesn't seem to hold them. Woodpeckers are a pleasure to observe. They are beautiful, conspicuous birds with a lot of personality. I especially like their distinctive markings and their sometimes raucous calls. If there is a red-bellied woodpecker or a flicker in your neighborhood, you'll hear it. To study woodpecker vocalizations, visit the “All About Birds” section of the Cornell Lab of Ornithology website, a terrific online resource. Finally, another thing to appreciate about woodpeckers is the service they perform for other birds. Species such as kestrels, bluebirds and screech owls—which lack the ability to chisel out their own nesting cavities—sometimes use those created by woodpeckers. Identifying sparrows: You can do this! There will always be certain families of birds that challenge our identification skills more than others. For some it's the warblers, those colorful migrants that tantalize us every spring and then pass through again in the fall, traveling in disguise. I have this image of the males packing away their mating season finery in little trunks, somewhere up in Canada, and then starting their journey south. But warblers are easy to ID compared with other groups. Some gull species have the annoying habit of assuming different looks during their first three years of life. And the field marks we rely on to tell gulls apart can be subtle at best. Ditto for shorebirds. Trying to sort out the various “peeps” on a busy mudflat or beach is a headache waiting to happen. Some people think of sparrows as being hard to manage as well. I disagree. True, they all tend to be brownish. Some are even drab. But as with most birds, if you look at sparrows closely you will be rewarded. You'll see the markings that distinguish them, and you will notice a subtle beauty that few take the time to appreciate. Many sparrow species are quite easy to observe. Most prefer the ground, not the tops of trees. They are less hyperactive than warblers. And, because a big part of their diet is seeds, they like to hang around feeders. Of the 20 or so sparrow species you could expect to see in DuPage County, more than half are potential visitors to your backyard. That includes juncos and towhees, which are sparrows too. Before going on, let's dispose of House Sparrows. No, not literally, though most of us wish we could. If your backyard is anything like mine, House Sparrows are a pest. There are simply too many of these gluttonous birds, which are actually members of the finch family, imported here from England in the 1850s. It's the true sparrows that deserve our attention. Most of them are noticeably smaller than House Sparrows, with finer features and markings. They are generally seasonal visitors as well. Just as robins can be found here in winter, so can several kinds of sparrows. Sightings of Song, Fox or White-Throated Sparrows are not uncommon when the snow flies. This winter, in fact, I occasionally spotted one or two White-Throateds under my feeders. Another species, American Tree Sparrow, only visits this region from late fall through March. To them, Chicagoland is a winter hot spot! They spend the rest of their time on the Arctic tundra. But now, in March, is when the sparrow activity really starts to pick up. Song Sparrows arrive on the scene first, followed in April by Fox, Chipping, White-Throated and White-Crowned. Watch for them under your feeders and bushes, and try tossing a some millet seed on the ground or patio to help attract them. The Song and Chipping Sparrows will stay with us all summer, while other species head north to their breeding grounds. This spring, make a point to watch a male White-Throated Sparrow with its bold black and white striped crown and bright yellow spots between the eye and bill. It's a beautiful bird (especially from the neck up) that's easy to observe and deserves a closer look. Seeing one and hearing its sweet song has been known to change a beginning birder's opinion about sparrows! Several local sparrow species require vast grasslands to thrive and for that reason their local populations have been declining. Fortunately, intense restoration efforts at places like Springbrook Prairie Forest Preserve in Naperville are paying dividends. Springbrook is probably the best local spot to find Henslow's and Grasshopper Sparrows. These are secretive birds, however, so it's a big help to study their songs and call notes before starting your search. If you're new at this, a good strategy is to join other birders on a field trip that focuses on grassland species. Visit dupagebirding.org for a schedule of upcoming trips conducted by the DuPage Birding Club. It was a Springbrook field trip, in fact, that led me to my first and only Nelson's Sharp-Tailed Sparrow. Now that was a secretive bird! At least Henslow's and Grasshopper will occasionally perch on a weedy stalk or fencepost. Not the Nelson's. It took several hours to finally catch a satisfying glimpse as the bird moved mouselike in the grasses along the edge of a pond. But what a little beauty with its orange face and breast—definitely worth the effort. I haven't seen all the species that naturally occur in this region. That's okay—it gives me some birds to look forward to. Two of them are sparrows, Vesper and LeConte's. I'll track them down one of these days. Then, just maybe, I'll take on the challenge of those gulls and shorebirds. For birders, there is always something new to learn. In the history of American birdwatching, two names stand out: John James Audubon and Roger Tory Peterson. They were the giants, each belonging to a different era. Audubon lived from 1785 to 1851. He was a painter, not a birder as we think of birders today, but he raised the public's appreciation for birds. And of course his namesake organization remains a positive force on conservation issues. Peterson passed away in 1996 at age 87. He invented the modern field guide in 1934 and spent his life perfecting it. Along the way he established himself as a multitalented bird man, sharing his considerable skills as a writer, painter, photographer, public speaker, ornithologist and educator. Peterson's later years were filled with honors, including the Presidential Medal of Freedom in 1980 from Jimmy Carter, an avid birder himself. In 2008, birding magazines celebrated the 100th anniversary of Peterson's birth. Numerous articles appeared by people who knew Peterson well, and some by people who met him just once and never forgot the encounter. I read them all, attempting to satisfy a personal craving for more information about the man who helped introduce so many of us to the world of birds and nature. Just the name Roger Tory Peterson recalls my “nature boy” days in the late ‘60s and early ‘70s. My favorite magazine then was Ranger Rick, and each year its publisher, the National Wildlife Federation, issued a set of nature stamps. I collected those stamps with a passion, affixing them in the paperback booklets and then placing each year's booklet in a handsome wine-colored album from NWF. The stamps and supplies were well worth my allowance money because the featured artist was Peterson. How I admired his work and reputation! Though I'd never seen RTP in person or on television, on the hero scale he was right up there with my baseball idols, Roberto Clemente and Brooks Robinson. Naturally I knew about Peterson's field guides, too. Our home in Ohio contained several from the series, including the one for eastern birds. I used the checklist in the back to record my sightings. Today I keep one Peterson bird guide at home and one at the office. Neither one stays closed for very long. But while the field guides exhibit the talents of the author and artist, they don't reveal much about Peterson the man. For being such a legendary figure in the fields of birding, ornithology and nature publishing, Peterson kept a low profile. He related well to people and (like Audubon) enjoyed his celebrity status. But RTP had a shy and reclusive side as well. I only know these things because I just finished reading an outstanding new biography called “Birdwatcher: The Life of Roger Tory Peterson.” Researched and written by Elizabeth J. Rosenthal, this is a book birders have been waiting for. It goes way beyond all the magazine tributes, taking us inside Peterson's remarkable life. Without taking her subject down a notch, Rosenthal shows us RTP's human side. We learn about his deficiencies as a husband (three wives) and his shortfalls as a father—neither surprising given his workaholic ways and a global travel schedule that included 18 trips to Antarctica to study penguins, his favorite bird family. We're told that he sometimes procrastinated, ate too many sweets and could be a little tight with money. We also discover that Peterson was not keen on getting up early—quite a liability for a birder! He was a night owl, preferring to work late in his Old Lyme, Connecticut, art studio. Peterson always had a lot on his plate. He was consumed by projects, including constant updates to his many field guides—eastern birds, western birds, wildflowers, butterflies and more. An unfinished page to the fifth edition of his guide to eastern birds was on his painting easel when he died, which shows how Peterson pushed himself to the very end. We should all be so driven, and our talents so in demand, when we approach 90 years old! For more information about “Birdwatcher,” visit www.petersonbird.com. And be sure to read the book—you'll be glad you did. Also worth noting is the new “Peterson Field Guide to Birds of North America,”also released in 2008 and the first time eastern and western species are covered in a single Peterson volume. So, more than 12 years after his death, RTP's body of work continues to grow. Appropriately, the new guide's cover features a Northern Flicker, the species that sparked Peterson's interest in birds as a boy. His encounter with that woodpecker lasted only a moment, but what a career that moment inspired.